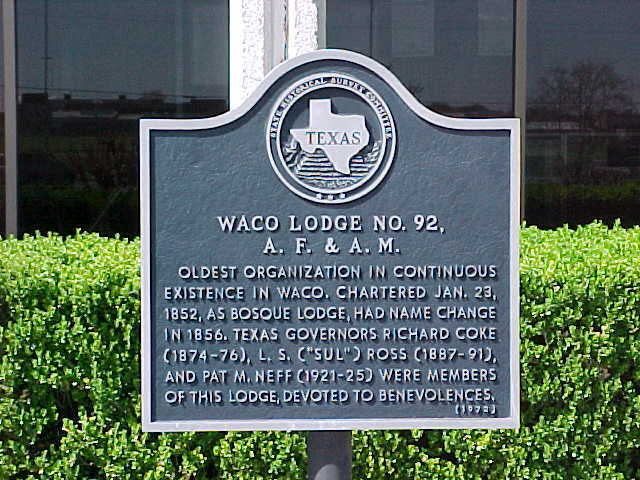 Waco Lodge #92 was the first lodge in McLennan County. It was first named Bosque Lodge and was chartered January 23, 1852. Below you will find some random tidbits from our history. For more, you should check out our other historical pages which include detailed biographies of members in our history. We have one for Past Masters, men who served as the lead officer of the lodge for at least one year. We also have one for the men who were members under our original Charter in 1852 and finally, there is a page for otherwise noteworthy members. It is still very much under construction but feel free to check back regularly and see who has been added. You can see a map of towns named after our members through the years by clicking here. There is list of other masonic lodges which count Waco 92 as their parent lodge on account of receiving their charter by branching off from Waco 92 during a time when our membership grew too large or for another special circumstance. That is located here. It was in a meeting at Waco 92 when a few brethren proposed building a bridge across the Brazos in hopes that it would “improve economic and social prosperity” in Waco. A committee was formed which later became the Waco Bridge Company. These bold men funded and built the famed Waco Suspension Bridge. There has been some misunderstanding about the early name of our Lodge. The name first selected was BOSQUE LODGE, for the Bosque River which converges with the Brazos River just above Waco, not for the town of Bosqueville. Literally Bosque means “A place of Thickets.” The original charter was issued to Bosque Lodge No. 92, January 23, 1852. It was in 1855, under Worshipful Master Joseph W. Speight, that a decision to change the name was made. The dispensation the change the name was granted by the Grand Lodge meeting in San Antonio, and on January 16, 1855 we became Waco Lodge No. 92. At one time, Waco Lodge was a “Moon Lodge”. In the early days many lodges met on, before, or after a full moon. Roads were poor, and getting from home to lodge was often a problem. The light of the moon made such journeys safer and easier. Many of the old lodges for sake of tradition, have refused to change their meeting dates. Just when Waco Lodge changed its meeting date is unknown. There are 17 lodges in Texas that meet by the moon. One of our dual members, Thomas A. Little, Jr., is secretary of Chambers Creek Lodge No. 499 that meets at 7:30 P.M. on Saturday night on or before the full moon. Without a doubt, the most remarkable man in the history of our Lodge, was Past Master Joseph W. Speight, having served as its Worshipful Master sixteen different years. He came to Waco from Mississippi, where he had served as Grand Master while only twenty-six years of age. He came to Waco in January of 1854, affiliated with Waco Lodge (named Bosque Lodge at that time), and was elected Worshipful Master from the floor the same month. At the outbreak of the Civil War he organized the 15th Texas Infantry Regiment and was commissioned a Colonel. When he returned to Waco after the War, his previous wealth was largely gone, but this did not stop his zeal for Waco Lodge and the community. He was active in the Baptist Church, City of Waco, Baylor University and the Grand Lodge of Texas. He is buried in the Oakwood Cemetery at Waco. On December 1, 1885, our Past Master Charles Alderton served his creation, Dr. Pepper, for the first time. An unusual meeting was held on September 18, 1922. This was the using of the “Traveling Bible” at the altar in conferring six Masters Degrees. This special Bible was circulated throughout the United States by Equity Lodge of Chicago, Illinois, and the Minutes of each Lodge where it was used were recorded in it. We received the Bible from Louisiana Lodge No. 102, and delivered it later to South McAlester Lodge No. 96, of McAlester, Oklahoma. These special minutes were printed in a very attractive fashion showing the names of each person present and with a brief history of Waco Lodge attached. This Bible is permanently displayed at the George Washington Masonic Memorial at Alexandria, Virginia. On November 24, 1914 was held the first of the “Musical Degree Ceremonies,” for which Waco Lodge was soon to become famous. The Candidate in the first degree was Brother Jake Tirey. Apparently, this was the first instance in Texas of a Blue Lodge having a musical accompaniment to the Master Masons Degree. The idea and the resultant music were so graciously and enthusiastically received, that the musical score was published and offered to other lodges throughout the State. We still have copies of this music in our archives. It was reported that at every performance the lodge room was filled to capacity with members and visitors. In the early days of our Lodge’s history, a cow horn was used to remind the Brethren of Lodge meetings. Usually, the Tiler would go early and blow the horn from the Lodge room window. At our Sesquicentennial banquet and program in January, Past Master Claude Ervin called the meeting to order by blowing this same cow horn. For the first 70 years of the Lodge, all the recording of the Minutes were made in “pen and ink.” In July, 1921, the Secretary started typing the minutes. This was a welcome relief, and less eye strain for those wishing to read them. In January, 1993, the Secretary started typing the minutes on the computer. This improvement made it better for the Secretary, as corrections may be made without erasures shown on the minutes. The Civil War came to an end in 1865, and the veteran survivors returned to this community as rapidly as possible. Immigration to the west brought great growth to Waco, and in 1870 the Lodge membership went above 100 for the first time. That year plans were laid for a second lodge in Waco, as a lodge membership “of such large proportions imposed too heavy a burden upon the Secretary and the Officers. When Waco Lodge was born, Napoleon III was in power in France; Queen Victoria was on the throne in England; Millard Fillmore was serving as the 13th President of the United States; P. Hansborough Bell was serving as 3rd Governor of Texas; slavery still existed; Indians and buffalos roamed the prairies; the Civil War was yet a long way off, and Teddy Roosevelt had not yet been born. Our first Worshipful Master, Clairborne Varner, in 1856 was a leading cattleman of McLennan County and that year he “staked” two youths to a start with a select herd of 430 longhorns. The two novices were Wesley Sheek and his stepbrother, Charles Goodnight. The herd moved to grazing land in Palo Pinto County with the two boys to receive one-fourth of the increase for a nine year period. In 1865 the herd numbered 4,000 head and Varner sold his interest to his two partners. So we find that Charles Goodnight, who became one of the West’s greatest ranchers, received his start at Waco, as a protégé of our Masonic Brother Clairbone Varner. During World War No. 1, Waco Lodge issued a certificate (written in three languages-English, French and German) to all members of Waco 92 in service that were going overseas, commending him for care and aid, and directing whomsoever might find him in distress or need, that any expense incurred would be repaid by Waco Lodge. A rather unique event occurred at a Called Meeting in August, 1942. A fire in a near by store building temporarily put out all the electric lights in the vicinity. For the first time in the Lodge’s history, a Candidate for the Master Masons Degree was raised in total darkness. On Saturday, September 25, 1937 Waco Lodge No. 92 invited Oak Cliff No. 705 to confer the Masters Degree in what was known as the Full Form Spot Light manner at Waco Lodge. There were present about 200 Masons from Waco, Dallas and other cities in the vicinity. Before the work was started the Waco brethren served the visiting members lunch in the banquet hall. The Minutes of Waco Lodge for September 10, 1864, record a Resolution adopted, that “dues and fees” would be accepted in Confederate currency, but credited at only 10 cents on the dollar. When Brother J. W. Speight became the 4th Worshipful Master of our lodge in 1854, he was Past Grand Master of the Grand Lodge of Mississippi. J.H. Gurley Lodge No. 337 was named after a deceased charter member of Waco Lodge No. 92. On February 7, 1851, a group of Masons met in a shanty on Bridge Street, here in Waco, for the purpose of organizing a Masonic Lodge. A request was made to the nearest Lodge, Springfield Lodge No. 74, at Springfield, Texas, (then the county seat of Limestone County). Springfield Lodge later moved to Mexia, Texas, as the town of Springfield burned down. At a special called meeting of Springfield Lodge on February 11, 1851, approval was voted and the application was endorsed to the Grand Lodge. The Grand Lodge granted dispensation, and we were set to labor as Bosque Lodge, U.D. (Under Dispensation), on August 1, 1851. After some delay, the Charter was issued on January 23, 1852 to Bosque Lodge No. 92, Waco, Texas. When Bro. J.W. Speight became Worshipful Master in 1854, wheels were set in motion to change our name, which was approved by the Grand Lodge, on January 16, 1855, we officially became Waco Lodge No. 92.